I typically read a lot of YA, but I felt like I read a lot of diverse YA this year, and have challenged myself to read even more diverse YA fiction next year. 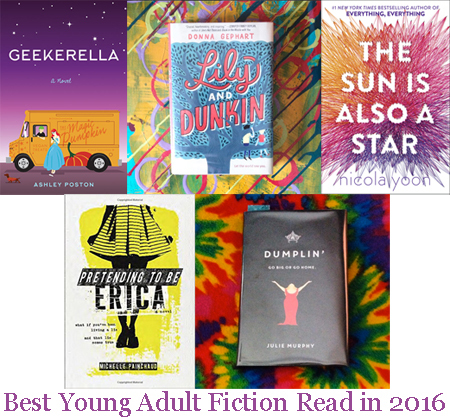 My top 5 YA books read this year are typically white, I’ll admit, but there’s a good one about gender identity and one with different races, cultures, and a very eye-opening perspective about being an illegal immigrant. Geekerella by Ashley Posten (2017). I don't like scifi or the related conventions, and I'm not a fan of fairy tale retellings, therefore you'd think Geekerella is not the book for me. But it drew me in with the quirky cover, and when I started the first page, I was hooked. You kind of forget it's a Cinderella story because the plot is so interesting, and the characters are great. You're rooting for Elle from the beginning, hating her evil stepmother and stepsisters, and you also get sucked into the story of Starfield and the fandom surrounding the show. I totally loved this book and already want to re-read it! It's going to be a hit. Lily and Dunkin by Donna Gephart (2016). I LOVED this book. Beautifully written, with an amazing storyline that wasn't overshadowed by having a transgender character. Instead of the book only being about a transgender character and using that attention to build hype, this book truly stands on its own as a wonderful, touching story about family and acceptance. The transgender issues were perfectly addressed, though, without being too easily overcome or coming across as too preachy. I highly recommend this book to everyone. The Sun is Also a Star by Nicola Yoon (2016). I loved Everything, Everything when I read it last year, so I couldn’t wait to read Nicola Yoon’s second book. Natasha is all about science and facts. Daniel is a poet and a dreamer. Their paths cross by total coincidence and changes the course of their lives. The book is tied together from different characters’ points of view, as well as different sections of facts about science, coincidence, poetry, and dreams. This book is beautiful and suspenseful because of the ticking clock of Natasha’s family possibly being deported. Nicola Yoon is quickly rising in the ranks to become my favorite author, and I already want to re-read both of her books. I can’t recommend her enough. Pretending to Be Erica by Michelle Painchaud (2015). I really loved the concept of this book. The jacket blurb didn’t really explain much so I wasn’t sure what the story was about, but I started it and loved the writing so I kept going and was SO thrilled with the subject matter and how it was written. LOVE. Highly recommend, but can’t say too much because I don’t want to give it away. Read this book without reading too much about it beforehand. Can’t wait for more from this author. Dumplin’ by Julie Murphy (2015). Love love LOVE this book! I had heard a lot about it but had to wait to get my hands on a copy of it. I read it in less than a day! Murphy is an excellent writer, and I wanted to crawl inside her world and live there for a week or so. Willowdean’s mom was a beauty queen in Texas, and has fit into her pageant dress every year since. Willowdean, on the other hand, is fat and doesn’t try to hide it. After her aunt, who was more like a second mother, passes away, Willowdean tries to find the confidence she used to have in herself, instead of in others.